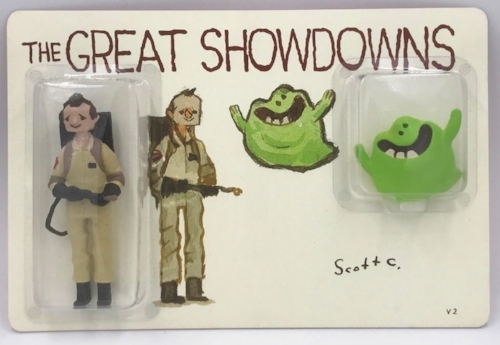 Great Showdown Figurine – Volume 2 — Scott C.
After a lightning fast sell out at this years San Diego Comic Con, Scott C.’s eager fans will have another chance at version 2. This revised version will have a neon green ghost and a more accurate color scheme for our favorite ghost chaser’s outfit. The Great Showdowns is the smash hit online series that we have seen in art shows and books depicting classic moments of great tension between characters in some of the greatest films of all time. This the very first figure ever to be created of Scott C’s work and the first in a series of Great Showdowns themed toys. This figure was sculpted by George Gaspar of Double G toys who helped bring Scott C’s characters to life. Each two figure set is 3 3/4” scale and will come on a signed card back. All figures are hand cast and hand painted. $120 each. Limit two per household. Ordering will be open for 14 days in TheScottCShop.com or while supplies last. Expect delivery around February 2018.